Though I always check my hotmail account, I rarely use it when setting up accounts in social networking sites, forum sites and other internet niche that require email address. I'd rather use any of my three gmail account or my long-time yahoomail. That is why I was kinda "duh!" 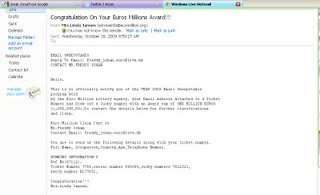 when I received a mail with "Congratulation On Your Euros Millions Award!!!" on the subject line. Who in the hell will send me this email when in fact I haven't even heard about Euro Million Lottery Agency. I think the sender is from Hongkong considering the .hk domain at the email of the person to contact when "claiming the prize." If I didn't know anything about scams, I would have jumped for joy and send my personal information at once for that is what the email states. "You are to send us the following details along with your ticket number. Full Name, Occupation,Country,Age,Telephone Number." Perhaps they don't realize that I'm aware of identity theft too. I was actually tempted to reply, not to give what they are asking but to pester them to the fullest. But being a tech support to my boss' website, I know I will just waste my time for my mail will definitely be marked as spam or deleted because it is not something of much use to them. And being such a segurista, I checked snopes to know other stories of lottery scam. Unfortunately, I can't find a story similar to mine (same contact person, same details) but the point is apparent that winning a large sum of money in a foreign lottery you don't remember entering is definitely a scam. I even googled the sender's name "Mrs. Linda Jansen". And tada! 61, 000 results appeared... (sigh) People will definitely do everything, even to lie at the expense of others just for money. * This is in fact the second email I received saying that I won in a foreign lottery. The first one was sent to my yahoomail.